Posted on Sat, Aug 15, 2009 : 4:45 p.m.
Nearly a thousand people attended Washtenaw County’s Second Annual Community Action Barbecue in Ypsilanti on Saturday. More than just a neighborhood picnic, the event distributed 800 boxes of food to families in need and included booths from more than a dozen area human service agencies. Under the beating sun, area families took advantage of the hot summer weather for an afternoon of food, friends and fun. The smell of grilled ribs and hamburgers filled the air and families chatted together under white tents. Laughing children, with their faces painted, played in the grass while a live band provided background music. Beside providing entertainment, however, the event was meant to tackle much more pressing matters facing the community. Pressity Smith, another Ypsilanti resident, is also looking for a job. The young mother of two children, both under the age of four, is getting divorced and is no longer able to stay at home with her children. “I have to get on my feet and this is definitely not the economy to do that in,” she said. Though sad, Benton and Smith’s stories are not unique. Aaron Kraft, coordinator of ETCS’s weatherization program, says the number of people requesting services has tripled this year compared to 2008. 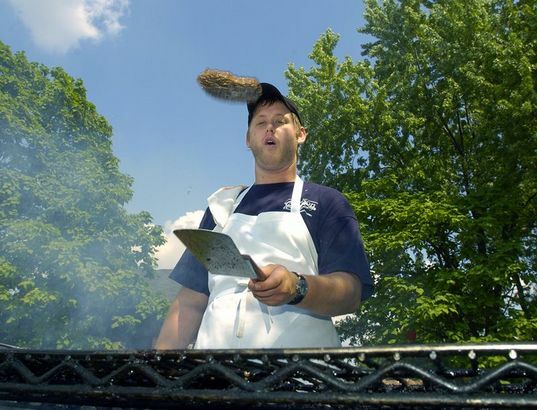 This year’s barbecue made more resources available than last year, including the attendance of representatives from the U.S. Census Bureau 2010, Washtenaw County Public Health and the American Red Cross, among others. “It’s important to bring the community together to become aware of the resources that are available through Washtenaw County Michigan Works,” Kraft said. Smith said she found information on pursuing a career in criminal justice and on how to start her own business from Ann Arbor Spark, a local economic development agency. For her, the event provided an all-around good afternoon. Photos by Lon Horwedel, AnnArbor.com Staff: Top, Michael Coheney, a cook from Carlson's Catering, Belleville, flips a burger into the air while preparing food for Saturday, August 15th's 2nd Annual Community Barbeque on Harriet Street in downtown Ypsilanti. The barbeque, featuring plenty of food, music, games and community outreach programs, was sponsored by Washtenaw County Employment Training and Community Services and this year paid tribute to retired local educator Joseph Dulin. 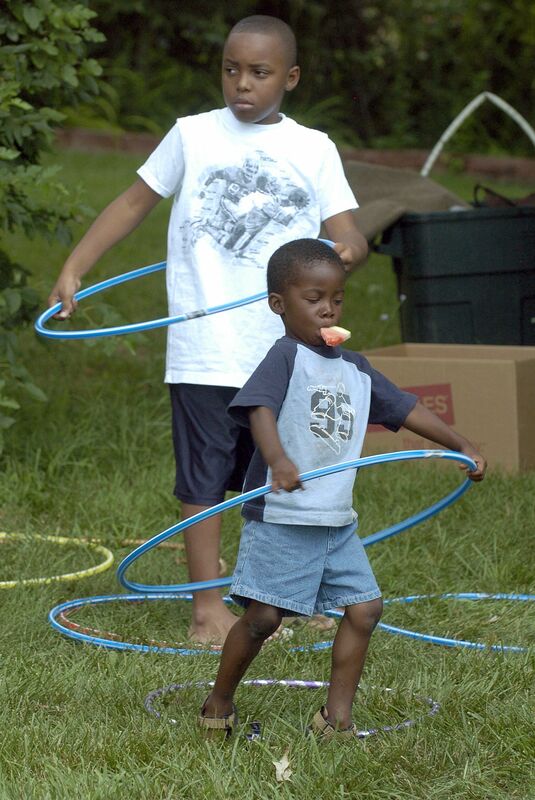 Bottom, Kamari Simpson, 3, Ypsilanti, gives the hula hoop a try while holding a piece of watermelon in his mouth for safekeeping as Torrence Williams, 9, Ypsilanti, background, gives it whirl himself. Erica Hobbs is a freelance writer for AnnArbor.com. Reach our News desk at News@AnnArbor.com or 734-623-2530.